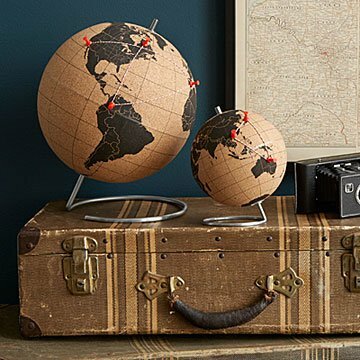 Track your travels in three-dimensional style with this eye-catching cork globe and color-coded pushpins. Spin through the memories of your past journeys and plan out future adventures in three-dimensional style with this interactive cork globe. Use the five red pushpins to mark the spots you cherish most, or even attach pictures, tickets, and mementos to relive the thrill of your trip all over again. Bringing a modern touch to your library or office, this personalized keepsake lets you celebrate the beauty beyond your backyard with every turn. Made in China. Large: 11.8" H x 9.84" dia. Mini: 7" H x 5.25 dia. Honestly this globe came out to be exactly what I wanted and needed. I bought more pins separately and used different colors of string to use to map out trips my boyfriend has been on, and trips we want to go on together. It turned out great. The one and only negative comment is that there is a very small section around the equator that sort of looks like shiny tape. I bought this gift for my boyfriend for our anniversary, to commemorate our travels. I bought a separate pin set so we could color-coordinate our individual travels and travels together. We had a great time putting the pins on together and remembering our trips. I recommend using pins with small round heads rather than push pins as the globe is small. This globe was one of the only cork globes I could find that delineated the states in the US, which i think makes it superior to others. I didn't love the plastic tape line in the middle holding the globe together but it's not noticeable from afar. Overall a great gift. QuThis is perfect on my bookshelf. The small one is a great, unassuming size, but not so tiny that you can't put pins right next to each other. I really love it. The globe is cute and has even the smaller islands (fiji,samoa,ect). BUT the tape running through the globe makes it look VERY cheap. I do not think something at this price range should look like I printed out the world and tapped it to a sphere. This was a gift for my husband to keep in his office to track his work travels. The problem is the big globe is really big and takes up a lot of space, so I had to get the small one. He problem with the small one is that the pushpins that come with this take up a lot of room on the globe. For example, when putting in a pin to mark his travels to Paris, the pin is so large it looked like he was marking all of Central Europe. My world-traveling best friend loved this gift! This globe looks perfect in my friend's living room. It is a great conversation starter for those who look closely, but also is subtle and attractive. Because only a few push pins come with the globe, I also purchased a set of 100 push pins. I bought a National Parks call calendar, tore out each scenic page, taped them together, and used this as the wrapping paper. The gift was a way to say "keep life's adventure going." It was a big hit! He remarked that he was excited to use the push pins bc he wanted to see what parts of the world his travels have overlooked. I guess it's one thing to know it, and another thing to see it... I suspect that this gift will result in more travel! Great design and size for a desk. Could use some more pins especially for the avid traveler. The globe is a great idea for a traveler. I shopped around and this seemed to be the best quality, though the price was high IMHO. The only more affordable options elsewhere had lots of bad reviews. We like the globe a lot. The 5 big push pins were way too big to fit near each other even with international travel. 5 pins is a silly number to give, especially for this price. We bought a box of little pins elsewhere.